So I was skimming through my overflowing WIP wagon (yes, it's literally a shopping cart full of WIPs and yarn that doesn't fit in my stash boxes) and I found a project that I almost forgot about! With all this chevron blanket knitting and crocheting I forgot that I started a sweater maybe a year ago. Heck, it might have been started way longer than that! If completed it will be my first sweater ever made! There have been past attempts at sweater making. Something has always good wrong: mistakes in stitches, losing place in pattern, being big enough to stick two of me in, etc. I've always felt like a novice knitter (despite making lace shawls, socks, gloves, and hats) because I've never made a sweater for myself. Technically I have made one baby sweater, but it was for my nephew and it never fit him, so to me it doesn't count! With this sweater I can finally redeem myself! 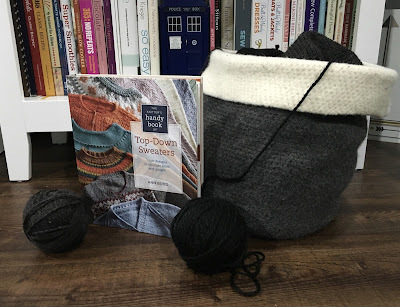 To make this sweater, I'm using the awesome instructions on raglan sweaters from the amazing book The Knitter's Handy Book of Top-Down Sweaters by Ann Budd. I highly recommend this book to all knitters. 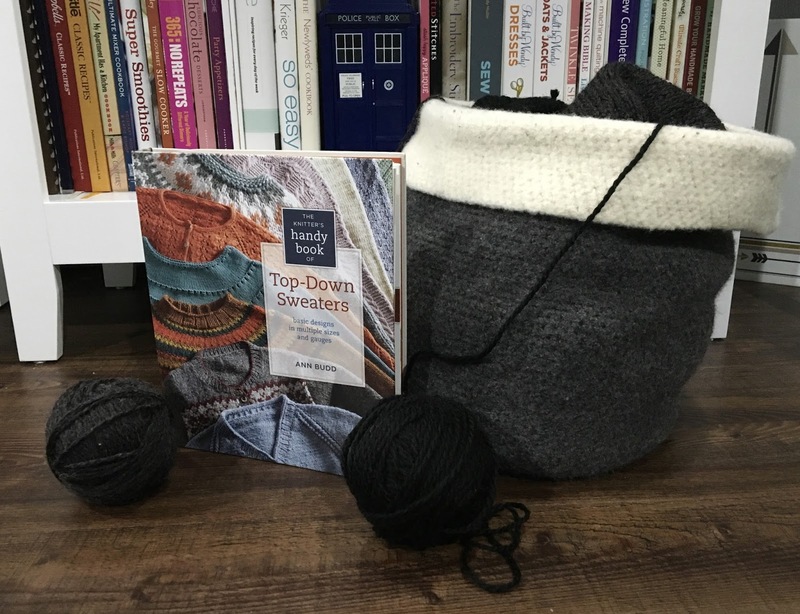 You can use this instructional book to create your own custom masterpiece or to follow one of the many sweater patterns that it contains. For the yarn, I'm using Patons Shetland Chunky in black and charcoal. I've had this yarn for a long long time. It was actually used for my very first sweater attempt way back when, but unfortunately it was a fail. The sweater was a fail, not the yarn. The yarn is actually quite nice. I'm not a huge fan of acrylic for clothing but the 25% wool it contains eases my mind. Plus you can just throw this baby in the washing machine and call it a day! You gotta love that! I guess it's only fitting using this yarn. 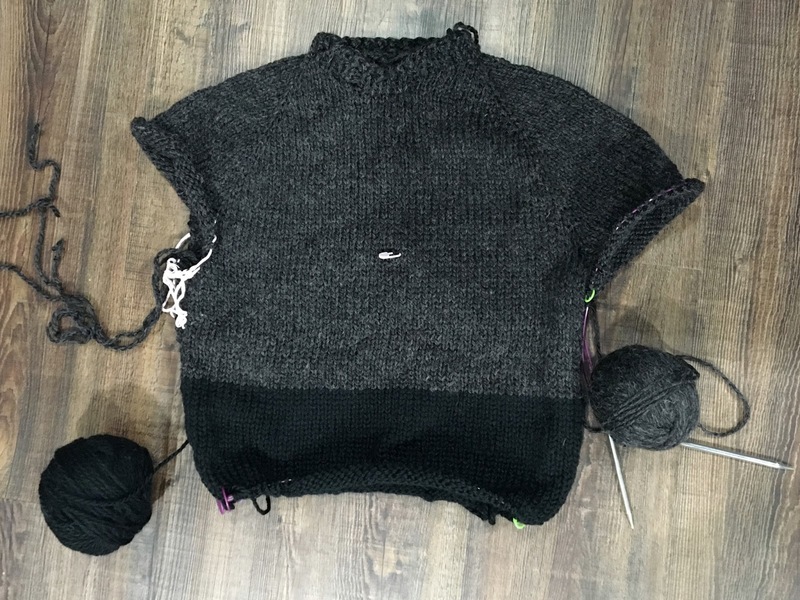 What better way to redeem myself as a knitter than to use the yarn from the very first sad failed attempt to finally complete my FIRST SWEATER?! Unfortunately this project might have to remain on the back burner. I think my sister is going to pop her baby out within the next 2 weeks and my gray and white chevron blanket still has a ways to go. Plus I have these grand ideas of making a hat, booties, and sweater for the baby. There's no way I have enough time for all that before she's born. There is always Christmas! I hope you finish your first sweater. I wear my handknit sweaters alot in the winter time they are warmer than store bought ones. Thanks Melissa. I'm feeling pretty determined. It might take awhile but it will be finished one day! I hope it becomes a winter wardrobe staple.